I really think the concept of news aggregation into an RSS reader changes the way many people access information and in fact, RSS/XML technology has enabled a revolution in the way people can access volumes of information in a relatively rapid way. The next evolution of this paradigm is being able to access all of your online accounts from a single location. Years ago, Excite allowed access to multiple brokerage accounts in such a fashion. 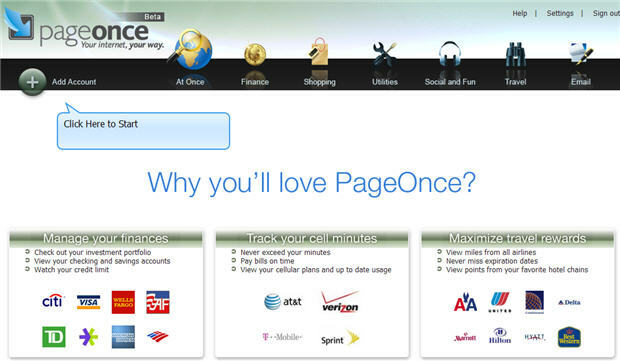 A company called pageonce allows you to access various accounts from a single interface and moreover allows them to be organized by category such as banking, telecom, travel, etc. I think it is inevitable that most web users start using such a service as it is just impossible to keep track of all the disparate sites we use. If a company like pageonce can get enough users on its service it could even be a conduit for advertising from the airlines and other partners it works with. Of course, whenever there is a new paradigm in the way things are done, there are barriers. And whenever there is a new area of the market which holds promise, there is competition. To that end, TechCrunch has a good article on the potential for growth and potential pitfalls pageonce may need to deal with as a company. \nI really think the concept of news aggregation into an RSS reader changes the way many people access information and in fact, RSS/XML technology has enabled a revolution in the way people can access volumes of information in a relatively rapid way. \nThe next evolution of this paradigm is being able to access all of your online accounts from a single location. Years ago, Excite allowed access to multiple brokerage accounts in such a fashion. \nA company called pageonce allows you to access various accounts from a single interface and moreover allows them to be organized by category such as banking, telecom, travel, etc. \nI think it is inevitable that most web users start using such a service as it is just impossible to keep track of all the disparate sites we use. If a company like pageonce can get enough users on its service it could even be a conduit for advertising from the airlines and other partners it works with. \nOf course, whenever there is a new paradigm in the way things are done, there are barriers. And whenever there is a new area of the market which holds promise, there is competition. To that end, TechCrunch has a good article on the potential for growth and potential pitfalls pageonce may need to deal with as a company.